Intended use: Conditioning runs, long distance at relaxed pace. Upper: Unlined open spacer mesh, padded tongue and collar lining, elastic 'Sauc-fit' midfoot panel. The new Triumph 9 has little in common with last year's model, having undergone a 100% makeover. While we were very impressed with the ride which the low profile sole unit and blown rubber had to offer, the upper was an extreme disappointment. We experienced arch irritation in the left foot when testing at higher speeds - the upper had incorrect placement of components, causing the one of the parts to dig into the foot. 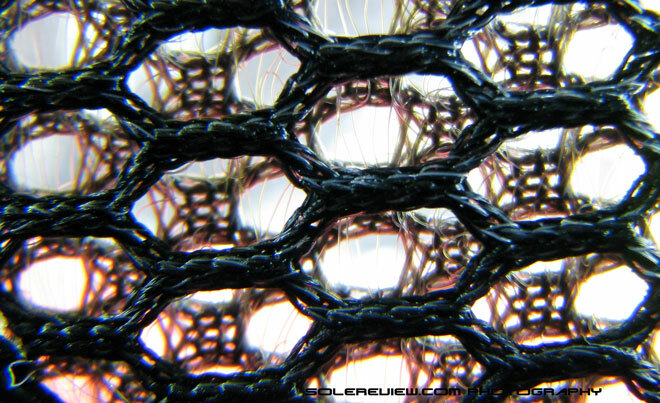 What's worse, the unlined mesh construction might potentially result in similar manufacturing defects. All of this after paying $130? We'll pass. It all started seemingly well enough. It was our first day of wear testing the Saucony Triumph 9, and we settled into our predictable routine of prepping for the 5k test run. 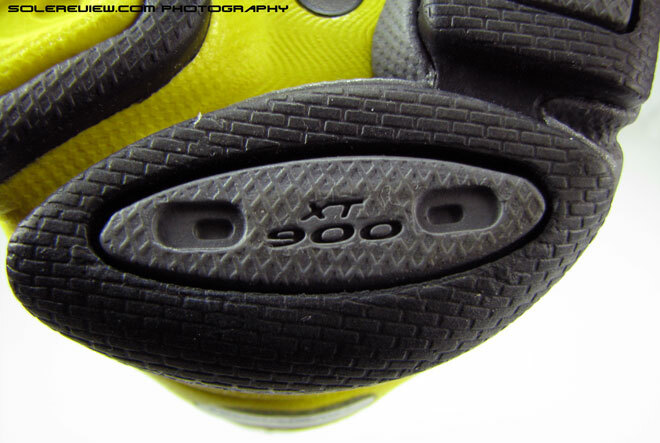 Everything about the shoe felt good – the foot sat over a cushioned insole, which had a soft, memory foam feel to it. 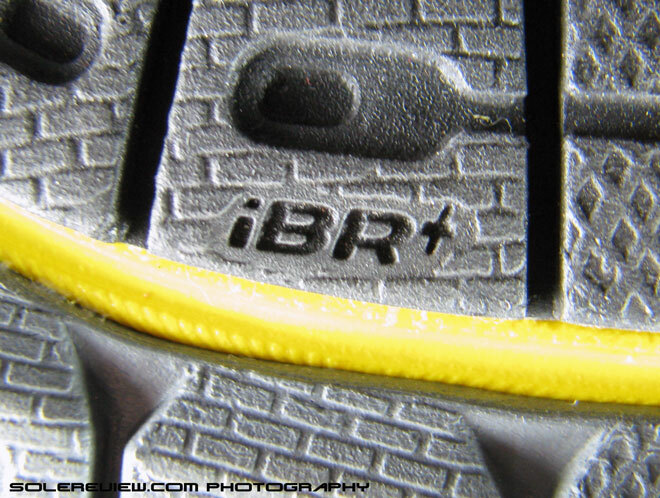 The upper had elasticated laces – you don’t see that very often, and they’re very useful too. Ends up securing the midfoot just right, with some stretch left over so that top down pressure isn’t downright uncomfortable. 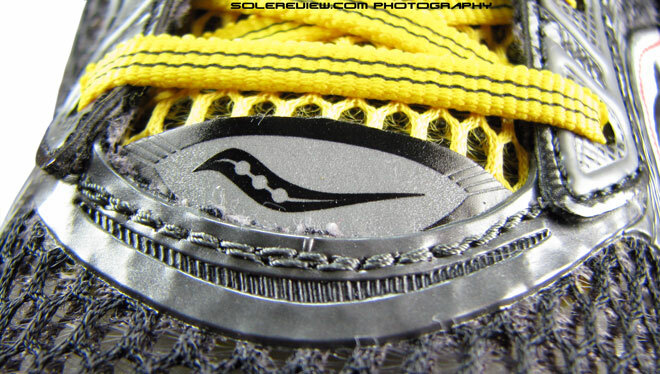 Closer look at the shoe revealed a pocket on the tongue (some other Saucony models have it too) where you could slide in a key, and with some effort, a folded twenty dollar bill. Neat. Tongue and heel collar lining felt soft to the touch and adequately padded, plus the ultra ventilated mesh felt ready to run into the wind. All signs pointed towards the start of a good day with the Triumph 9. This year’s 9 carries the Triumph name, but it has little in common with the previous version. It has new everything – a completely redesigned sole unit, new upper with updated mesh all over including the heel area, elasticated laces, and instead of the Triumph 8’s ‘Arch-lock’ panel in the midfoot, the new Triumph brings in the elastic ‘Sauc-fit’ which is meant for improving midfoot lockdown while minimizing heel slippage. Many of the new bits are really well thought out, with the intention of making the 2012 version better than the last. Let’s look at the sole unit to begin with. The 2012 Triumph 9 has dropped a massive 4mm from the heel to toe gradient, and the resulting 8mm heel-to-toe drop is equal to that of this year’s Nike Free Run 3. This was one area where we focused on during the initial run; and the results were happy indeed. Instead of hitting the outer edge of the heel first, the transition was smoother, with the landing point being the invisible boundary between the rear foot and midfoot. The heel crash pad has rounded edges and is separated from the sole unit by a deep groove, this also worked towards achieving an excellent heel to toe transition. 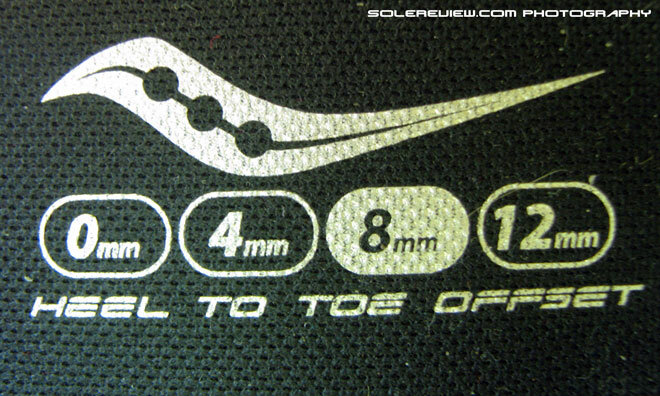 What’s better, the foam Strobel layer (below the sockliner/insole) has an increased thickness of 1mm, resulting in padded ride which extends right from the edge of the heel to the toe area. The outsole has an incredible amount of surface covered in soft, air infused blown rubber, eliminating any hard landings at all. 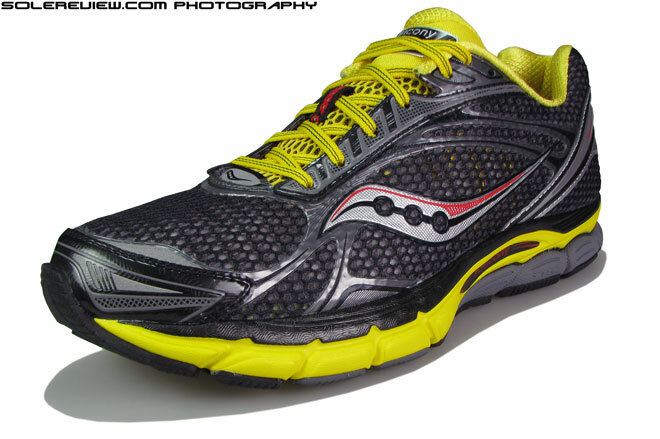 Heel cushioning is good too – while we were unable to isolate (from a sensation standpoint) the cushioning benefits of Saucony’s Powergrid system (Hard urethane Trampoline combined with foam), we can only conclude it is a sum of parts. Out of the six flex grooves in the forefoot, two are deep , exposed and sit in a recess, while the other four are placed across the blown rubber outsole pods. 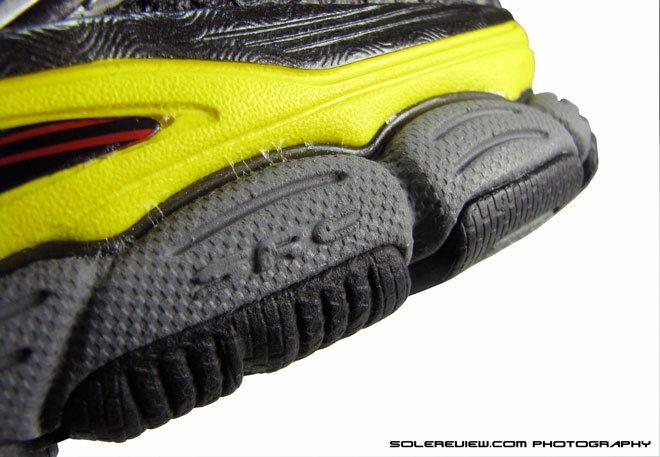 Needless to say, while the two exposed grooves do a great job of bending the shoe, they are helped by the other grooves which also flex well since blown rubber is far more pliable than solid rubber. While retaining all that flexbility, forefoot plant is reassuringly stable due to the wide midsole splay. To cut a long story short, we felt that the redesigned sole unit on the Triumph 9 was near perfect – great, consistent cushioning, ample traction and grip, no bumpy components below the insole, and finally, text book heel to toe transition and overall stability. The upper impressed us initially, though there were a few areas where we found the Triumph 9 lacking. 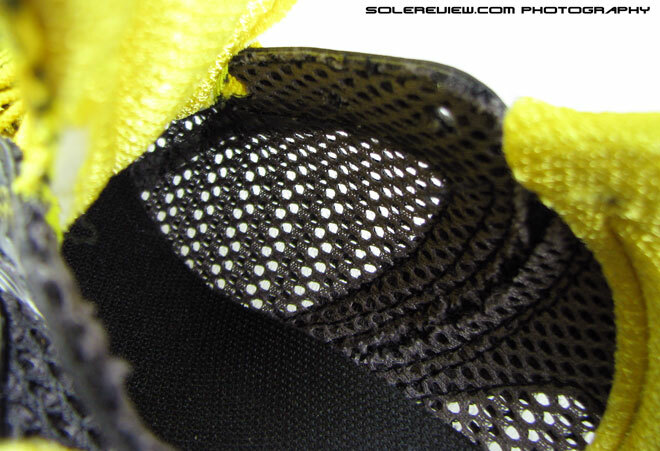 The good part first – the mesh ventilation is superb, due to its open cell structure. 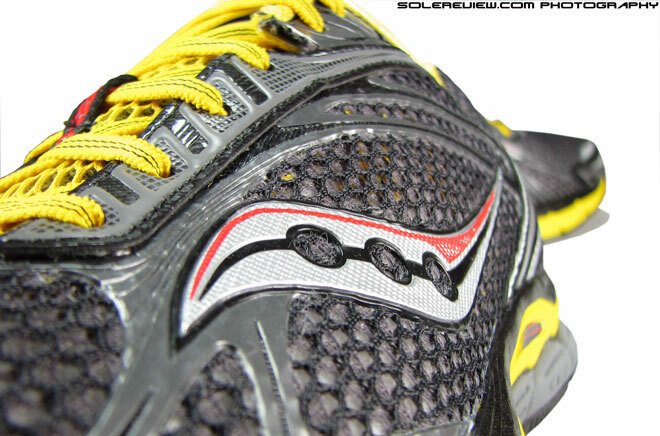 While nowhere near the plushness of the Glycerin 10, it still feels adequately soft to the touch. Added areas of details like fused reflective bits and molded logo and eyestay result create depth in visual appeal while adding support to the upper. With everything going so well during our initial test run, we mentally started awarding points to the Triumph 9, pleased with what it had to offer. However, the next test run changed everything – as if a clear, sunny sky suddenly turning into an angry, writhing mass of ominous dark clouds. Rather encouraged by the previous test session, we decided to throw in some variation into our weartest run the following week. We significantly increased our running speed for the entirety of the 5k distance. Felt good throughout, and the sole unit continued to impressed us. A few minutes after the run was over, things started to change. It began with a tingling sensation in the forward area of the left arch, which then worsened to become increasingly irritative, akin to a pin prick. We first thought a small piece of debris might have got in and was causing the irritation. We took off the shoe, inspected it thoroughly and found nothing inside. 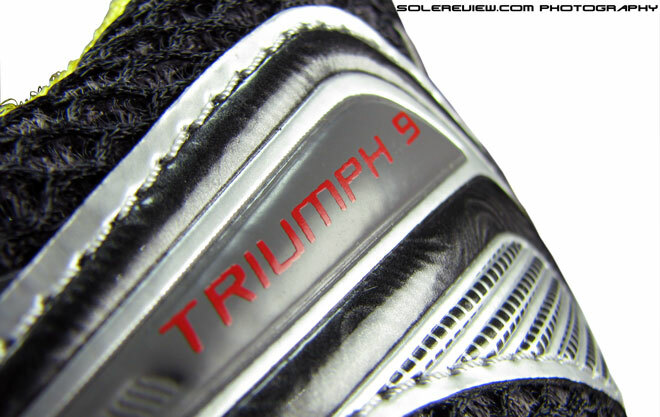 We gave the Triumph 9 benefit of doubt, and had a go in them again after sometime, at slow running speeds. No problem. But as soon as we dialed in some speed, the now familiar prickly sensation resurfaced. After removing the sockliner and looking very closely at how the upper patterns were stitched on the mesh, we noticed major discrepancies between the left and right shoe. 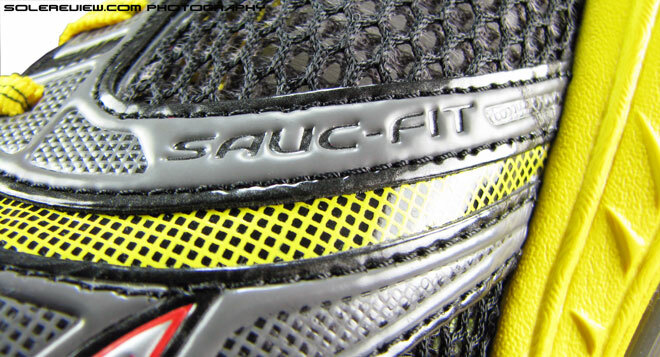 In the left shoe, the midfoot stitched-on panel with the ‘Sauc-fit’ panel was misaligned compared to the right, and that resulted in the unwanted pressure point. 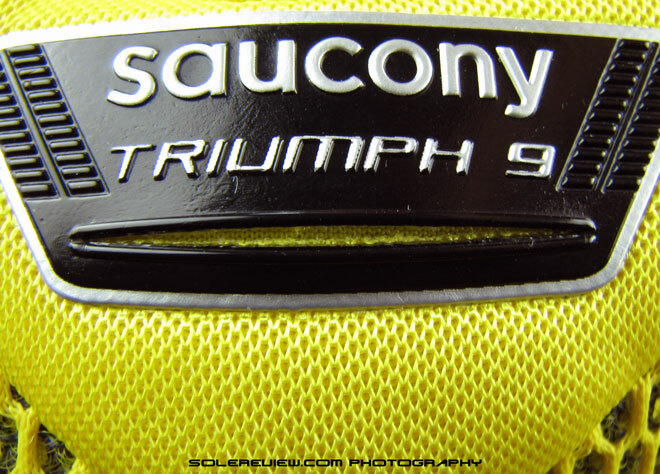 From our collective experience in athletic footwear manufacturing, we assume that the unlined, open mesh is a difficult material to manage when it is being stitched or lasted (attachment of the upper to the sole), so other examples of the Saucony Triumph 9 might be prone to this issue. Which is really a pity. The shoe otherwise is great, with a winning ride and loads of improvements over its predecessor. We’d like to think the manufacturing defect is an one-off thing but that fact remains that we paid the full retail price of $130 for this shoe, and for that kind of cash, such a glaring oversight in the assembly process is unpardonable. The Triumph 10 is around the corner, and we hope that the upper comes better constructed.